Plants and flowers will turn an ordinary patio into a garden patio, and set the stage for a peaceful and welcoming extension of your home. Treat your patio as an additional room and use plant accessories as an important part of this exterior living space. Your family and friends will enjoy the harmony and beauty of well arranged-plants on the patio while they enjoy a meal or conversation. A selection of plants and flowers will change the look of a patio. Set three plants in a corner, using one small, one medium and one large container. Place the largest plant in the back and the other two plants to the left and right in front of the large plant. Coleus come in a large variety of colored leaves and, as these plants mature, the corner will come alive with color. Pick a different coleus for each container. Select a wrought-iron chair to showcase a large chrysanthemum. Place the chair next to the edge of the patio or in a corner. Place a smaller mum at the foot of the chair, slightly off-center. Place small plants on tables next to chairs and one plant as a centerpiece for the patio table. Choose a 4-inch pot for small tables, and a 6-inch pot for the patio table. Suspend a hanging flower bracket from the side of the home by the patio door. Purchase a completed basket from a nursery, or fill your own with calibrachoa, scaevola, or trailing verbena flowers. Flip unused pots upside-down and set a container of equal size on top of the flipped pot. 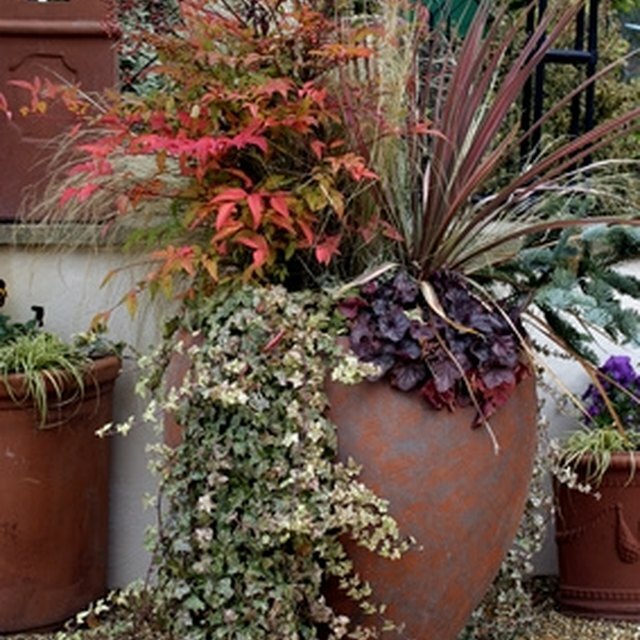 Use a decorative pot for the bottom or spray paint the pot a complementary color.